"Hey, where's the dummy behind us going? 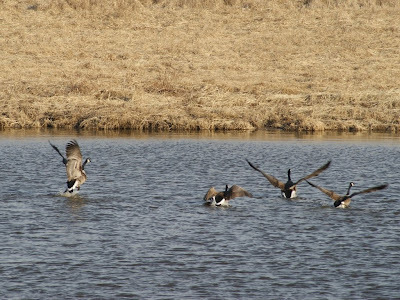 Skip, skip, and flap your wings!" "And, we have lift off!" "Hey where did they go? Dude is that a headless goose in front of us?" I was just picking on ya!" "This way! No... this way!" "I am King of the Geese World!" "Oh yeah? Can you walk on water like me?" "Skip, skip, skippin' on the waaaater." Great pictures, and your captions really made me smile. Today was my first CC post, and I have really enjoyed this meme, thanks! 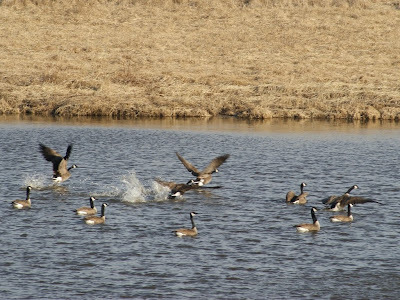 Lovely photos of the geese! It's so fun to watch birds in the water! What a cute post!!! I love to put words to what I think the critters are thinking of us humans. Hehehe I love the captions that go with your pics :) Happy weekend, and thanks for stopping by! Loved it, Misty - as always! Nice pics and captions. They're making a break for it! Always such a funny storyboard. 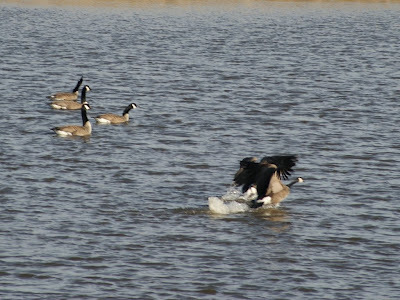 Heheheheh...Canada Geese...hehehe. I wonder where they came from? Nice shots...fun captions. 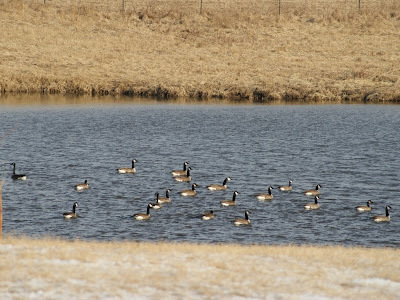 Lol I have starlings and you have an abundance of happy geese. I love the wings up shots. Good you took time to give even more life to all those pictures! Lol! I love the photos and the captions! Great post, Misty! I love the way you tell your stories! Good chuckle! Just watch out for those airplanes you silly geese! Great pictures! 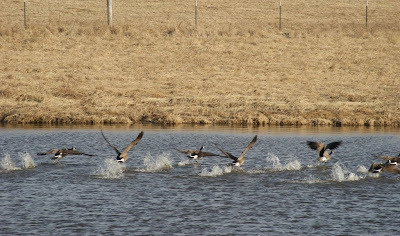 It amazes me that geese and swans ever manage to take off! That is a lot of really cool goose photos...the captions were very funny. Great stuff!!!! Love the action shots and the captions!!! I have such a horrid memory having to do with one of those things, I didn't think anything would amuse me about them, but you certainly got me smilin'. Thanks. Sorry I'm soooo... late getting around. This was another wonderful photo essay with your little touch of humor! I loved it. Your narration always gets me laughing!!! "Hey, where's the dummy behind us going? Wrong way Dummy!" is so darm funny! !